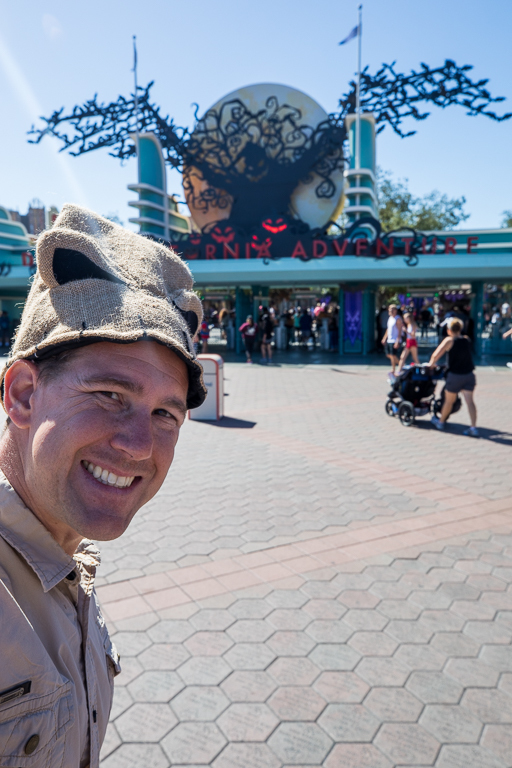 After spending a fun morning at Disneyland, it was time now to head over to California Adventure. Oh yeah. There's Oogie Boogie. I like how they've got decorations all over both parks. Our first stop is the fantastically themed Cars Land. 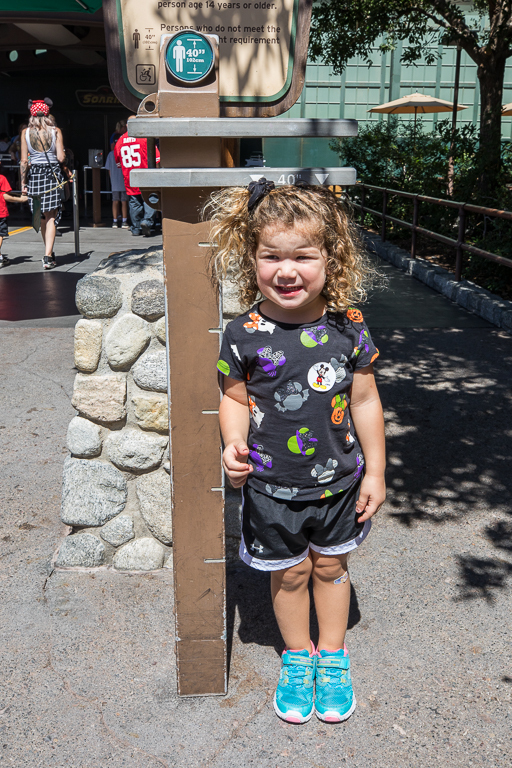 I love seeing how the residents of Radiator Springs decorate for Halloween. 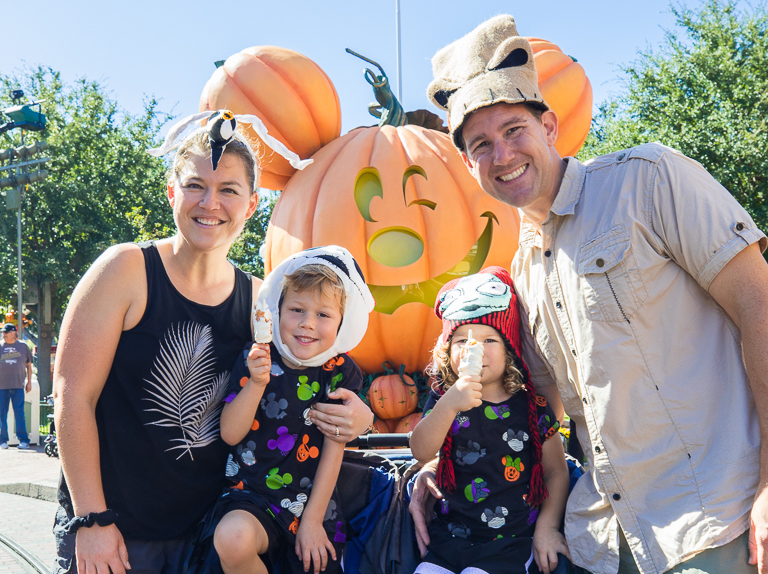 And even on a fairly simple ride, Disney makes the effort of changing the soundtrack for Halloween. 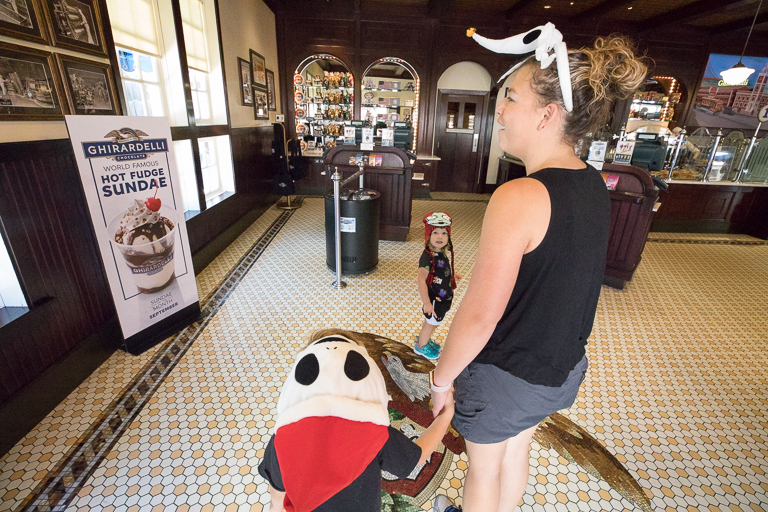 Normally at this point, we'd stop by the Boudin bakery for a bread sample, and the Ghirardelli chocolate shop for a chocolate sample. The kids like to make chocolate sandwiches. But for the first time ever since we've been coming here, Ghirardelli was out of chocolate samples... How unfortunate. 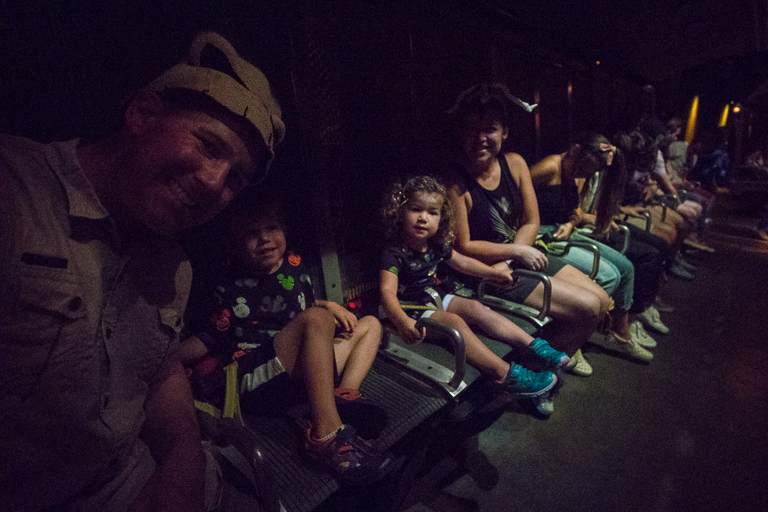 At the back of Pixar Pier, we used a fastpass to hop on the ride. Here I thought me and Ian were doing pretty well. We opened up the tank on the Green Army Men screen. And we immediately activated the robot during the Little Green Men screen. 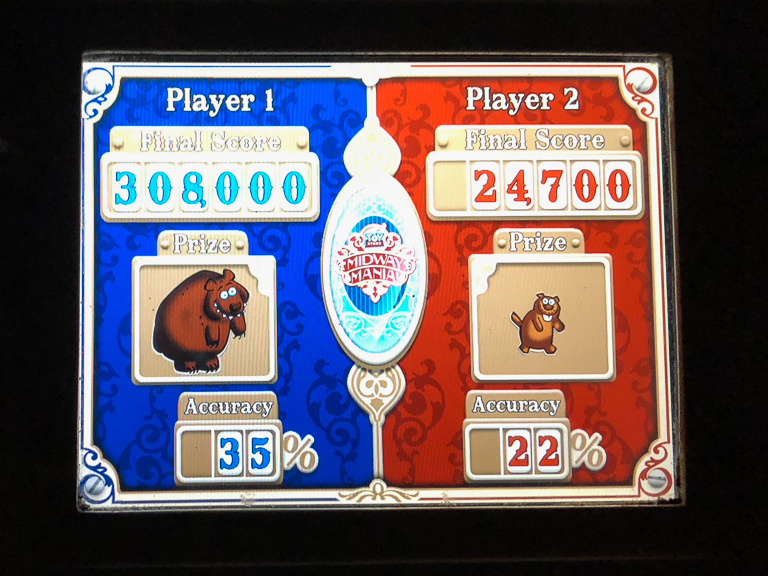 But Theresa is the one who claimed the high score today. Nice work T.
Lunchtime! Of all the new seasonal Halloween treats available, this is the one T and I were most excited about. 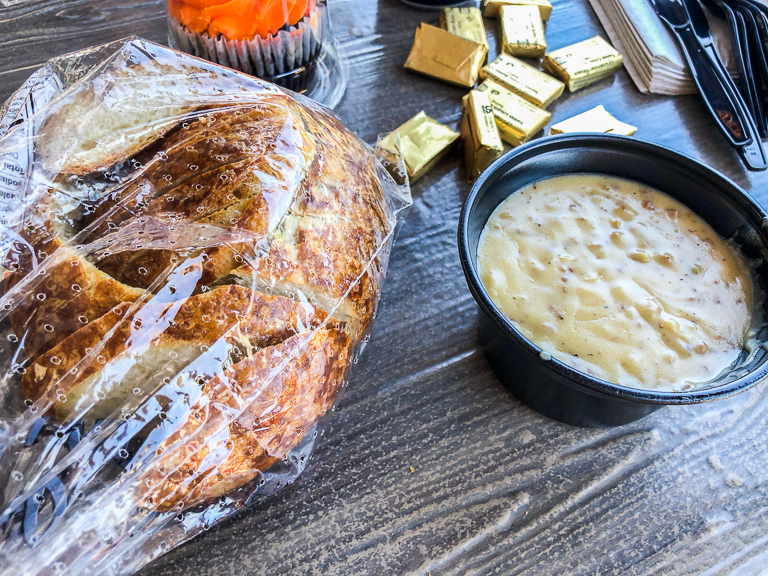 One of the best things to eat at Epcot is the Cheese soup at Le Cellier, and my favorite way to eat it is as a dip along with the Le Cellier pretzel bread. 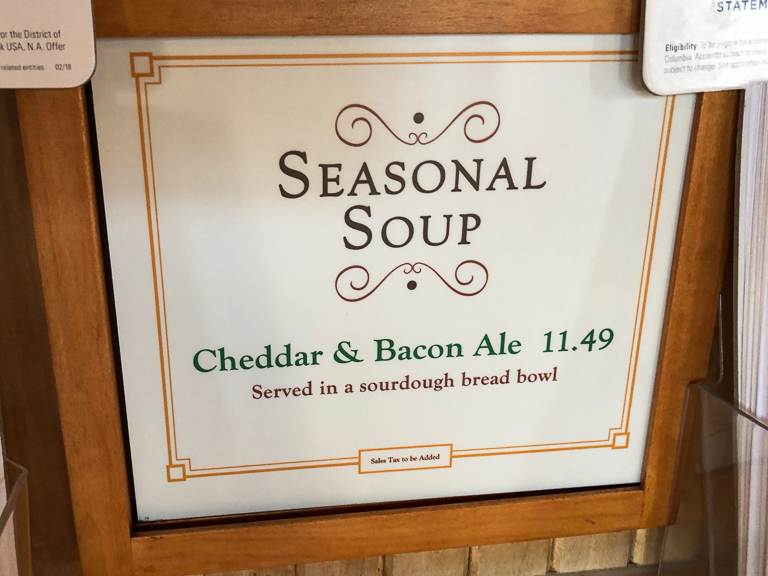 This Cheddar and Bacon Ale soup is at least the equal of the Le Cellier soup, and I might just actually like it a little better. There was quite a bit of bacon in it which pushes it over the top. And if you ask, they'll slice the bread bowl, which makes it the perfect size for dipping. I have a feeling I'll be eating quite a few of these in the coming weeks. 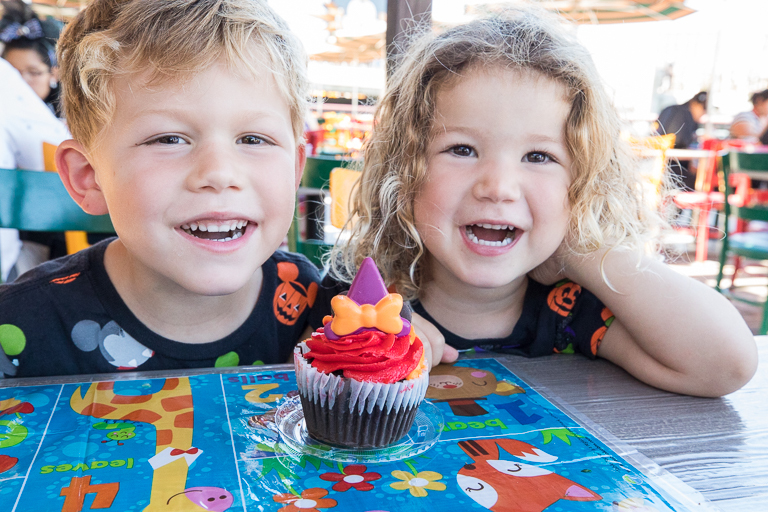 And after eating all their lunch, the kids were excited to dig into their halloween cupcake. 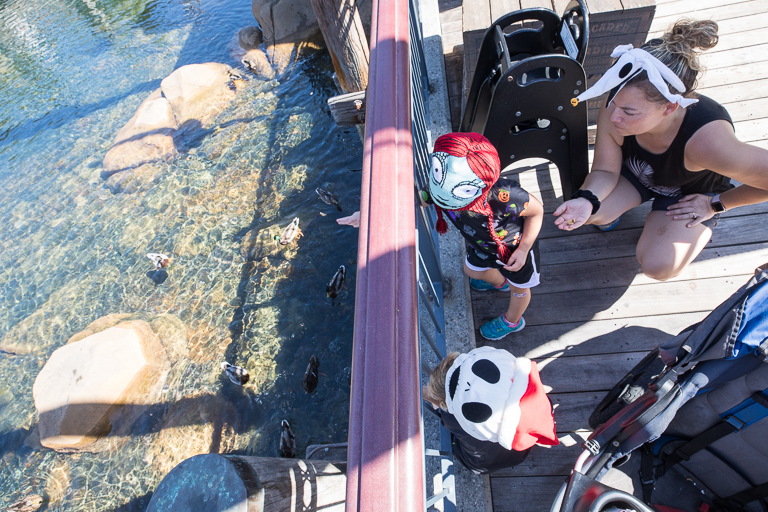 With their Santa Jack and Sally hats, Ian wanted to give "presents" of all his bread crusts to the ducks and seagulls hanging out below. 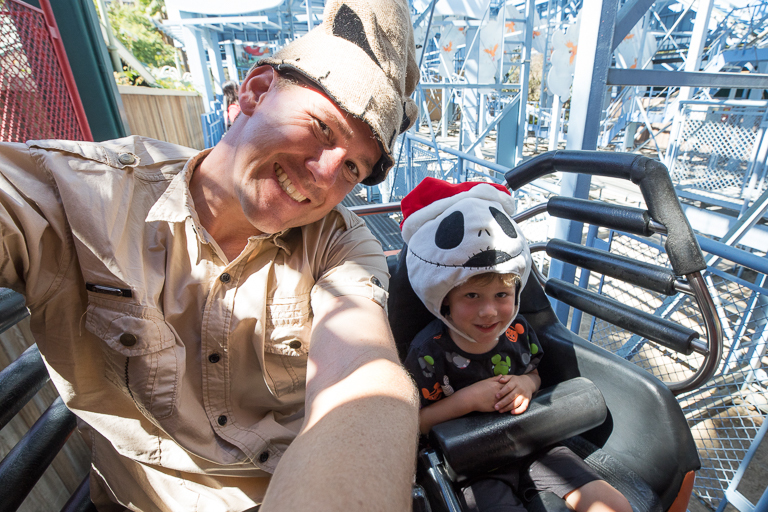 Ian and I split off and took a spin on Goofy's Sky School. 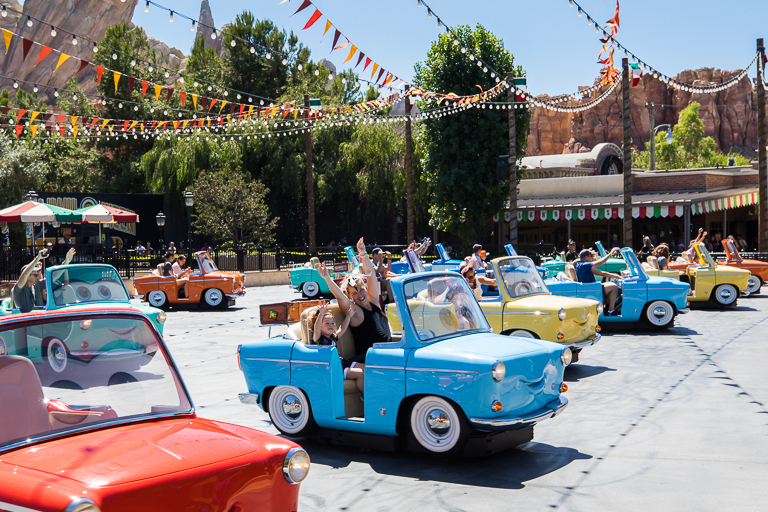 While Theresa and Alli danced with Luigi and all his cousins to Halloween songs on this rethemed ride. 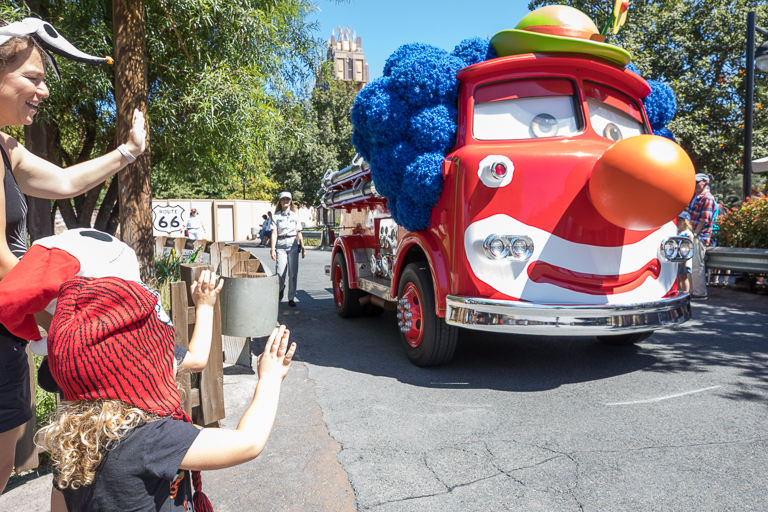 Waving at Red the firetruck in his clown costume as he drives by. This is the photo I really wanted to get. 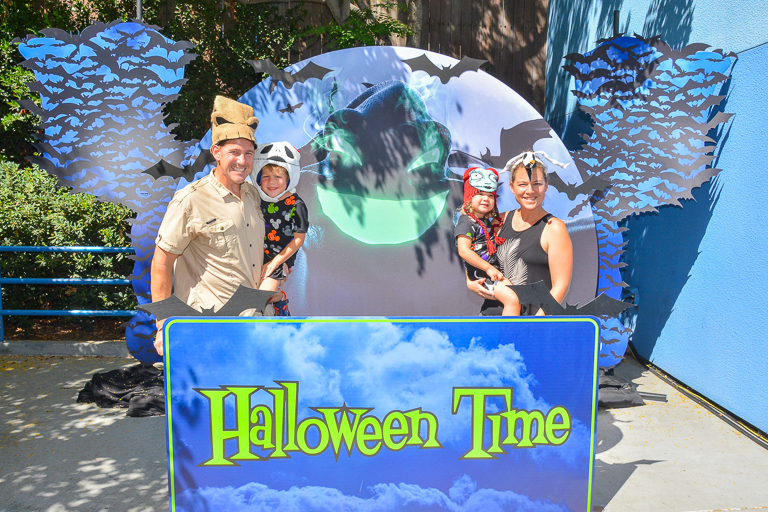 Ian has a similar photo at the entrance of Soarin when he turned 40 inches. Let's go ride! Ian tried to explain the ride but you just have to experience Soarin to understand it. Alli liked that it had all the animals. 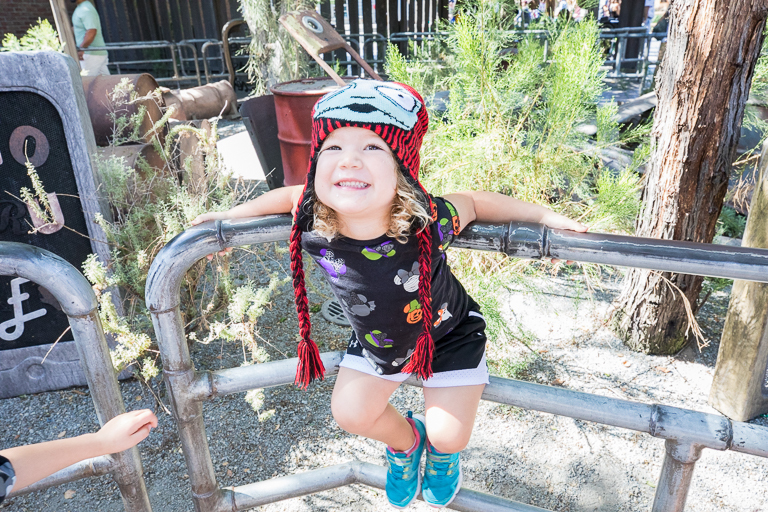 Her favorite part (that she kept talking about even after we got home) was flying over the elephant herd, and when the elephant tosses the dirt in the air, we fly right through it. 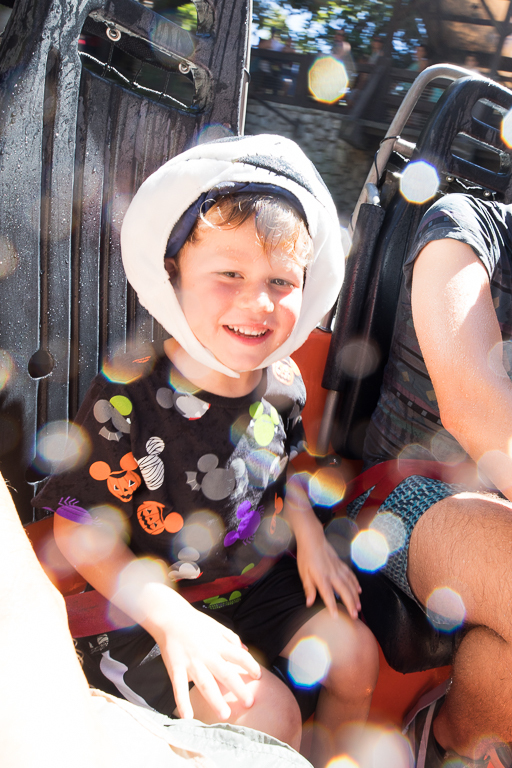 Ian really really wanted to ride the Grizzly River Run. Off we go while Theresa and Alli ride Ariel. Ian asked what the giant bear's name was. A cast member told him it was Timmy. 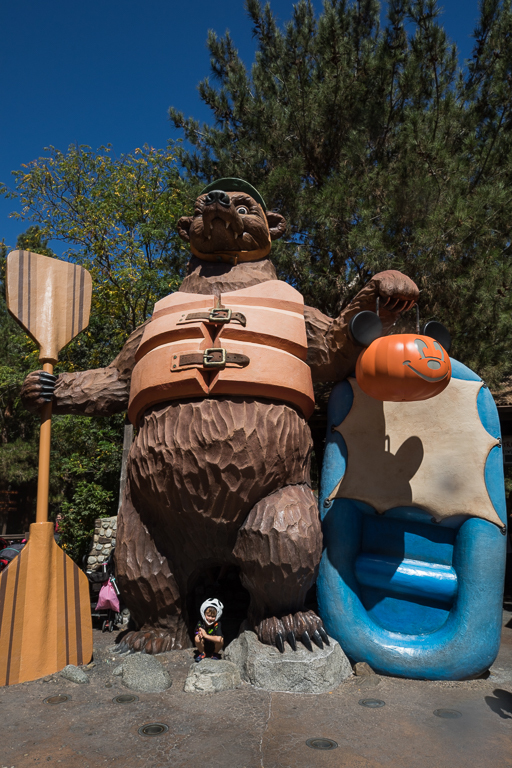 That's a giant Mickey pumpkin pail he's holding too. You're going to get soaked Ian. No, you're going to get soaked Daddy. If history is any indication, he's probably right. 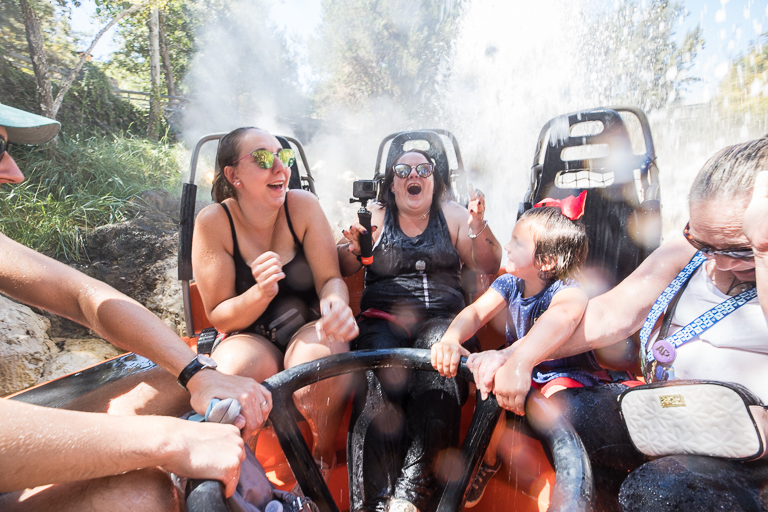 Throughout the ride I was getting splashes here and there, but nothing terrible. Even going down the big hill, I came away without getting too wet. But the geyser at the end... The geyser that somehow knows I'm coming and pours out just a little more water than normal. Without fail, it fired up just as I got there and soaked me. Yeah yeah, you were right Ian. One of those "ring out your shirt" rides because you get so wet. Ariel must have had a long line because we finished before T and Alli. 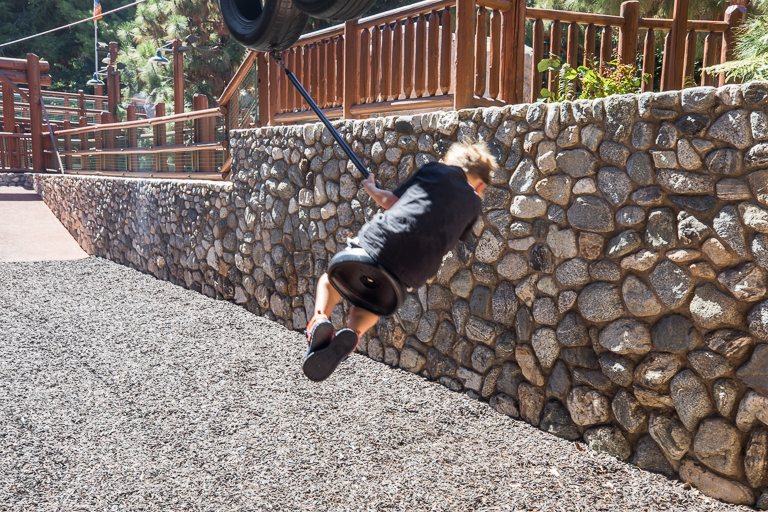 Ian said he'd dry off if he got to go on the zip-line in the Redwood Creek Challenge Trails. 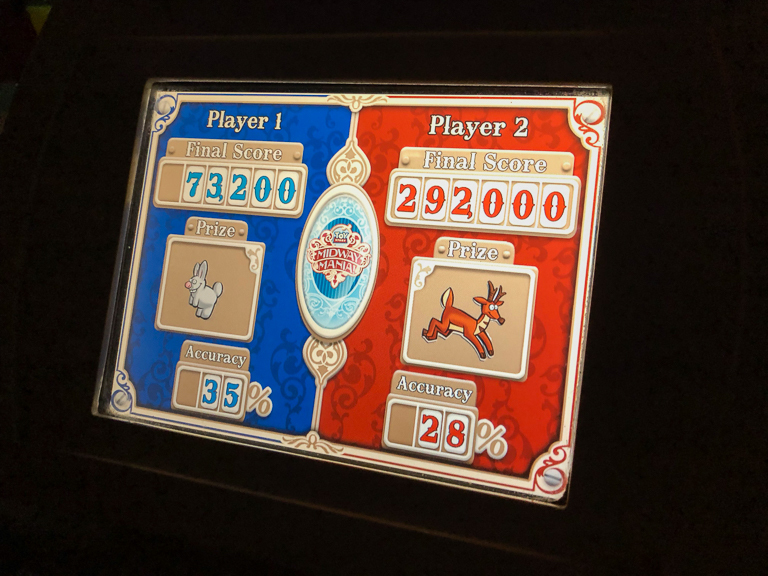 Before we go, I wanted to stop by the AP corner. We collected our free buttons and headed over to the photo-op. I would have loved if this were an actual character instead of a backdrop. There was a smoke machine running, but the harsh midday lighting makes it impossible to see. 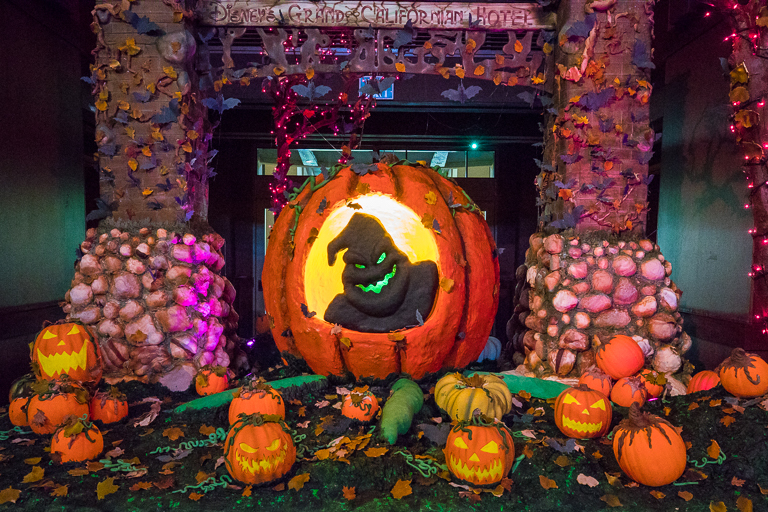 Still, it would have been awesome if Oogie Boogie as a walk around character would have been back here. 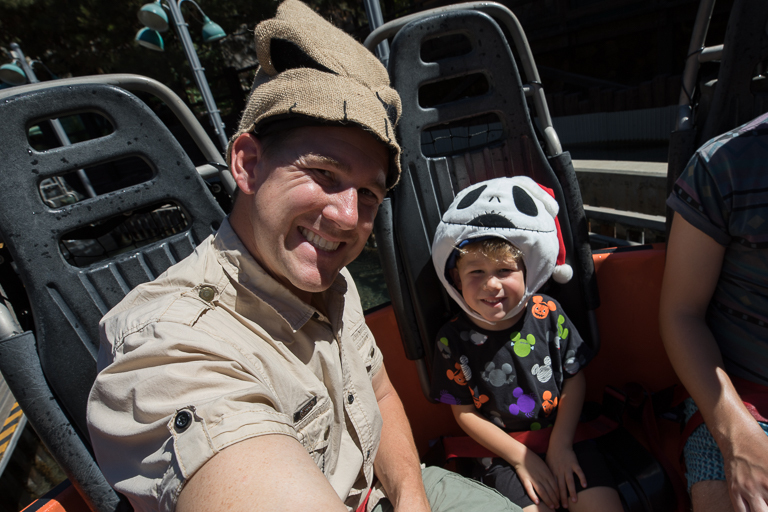 I heard there's just a little more Oogie Boogie around here. Not content to just do the Gingerbread house at Christmastime, those bakers are working extra hard to create this Halloween Pump"cake" Patch. Quite a bit goes into this. 200 pounds of powdered sugar, 40 pounds of egg whites, 180 pounds of rice cereal, 80 pounds of marshmallows, 60 pounds of butter, 80 pounds of dark chocolate, 60 pounds of white chocolate, and 300 pounds of fondant. 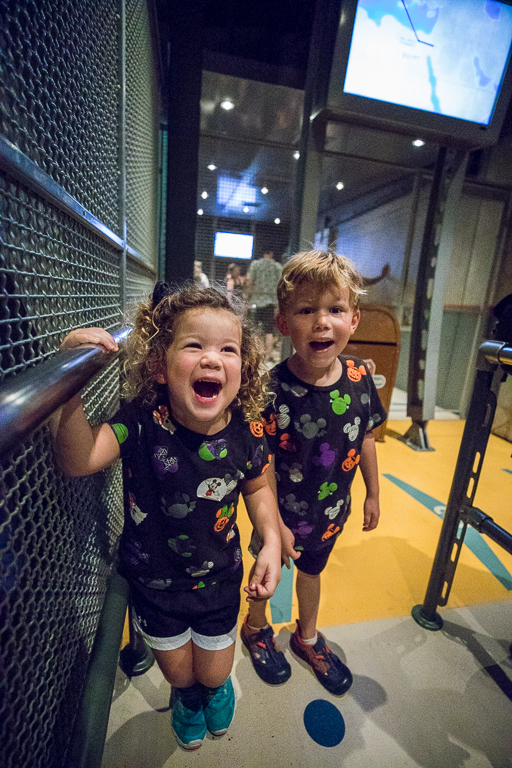 The kids enjoyed searching for the 13 hidden Mickeys. 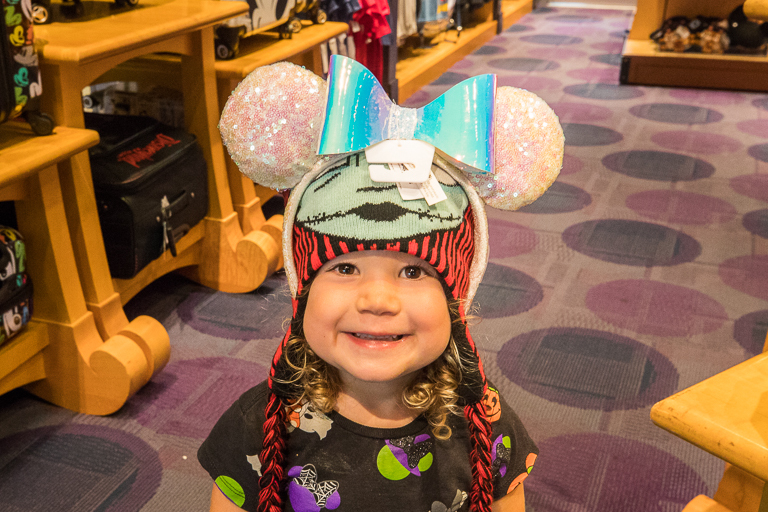 Daddy, do you want to take a picture of me with this headband? Of course I do Alli. Very cute. 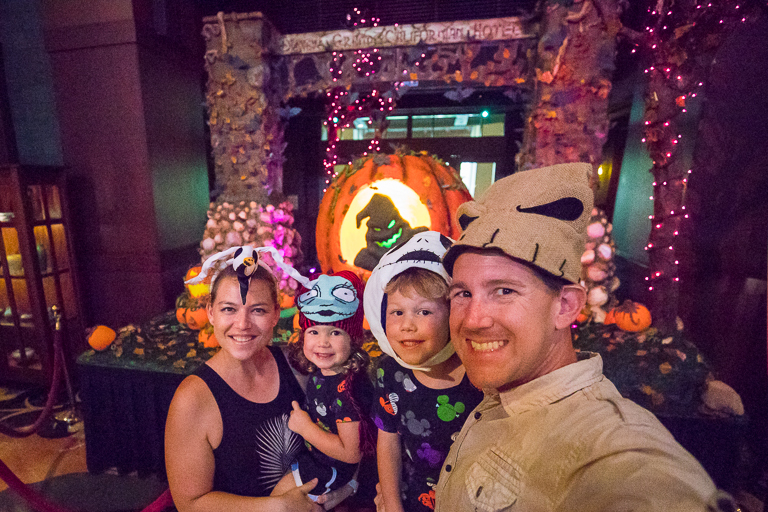 We're going to have a lot of fun this season celebrating Halloween Time at Disneyland! Bring on Fall! Hello Flowers family, I was first introduced to you, Joe & Theresa (T), via the trip reports on micechat.com (on those weekly "Wednesday Roundup" articles which disappeared when the site reorganized), which was before Ian and Alli joined the family! I'm glad I saw the Flowers' blog site on one of the recent TR's because I REALLY enjoyed those TR's, and was missing them on the reorganized site (I don't always look at the "right column" of a page where I rediscovered the recent TR's). There was something about the narration along with the lovely pictures that held my interest after reading your various TR's. I remembered always looking forward to a TR by the Flowers, and would be disappointed when one didn't appear. Now with Ian & Alli added to the "cast", it's even more enjoyable and added a new perspective to the trips. It's been amazing seeing how those little infants have grown (and continue to grow to hit those "height milestones") into such beautiful children, both inside and out (based on the narration and pictures). Many kudos to Joe & T for raising children to love and to respect people, whether they are family members or not. 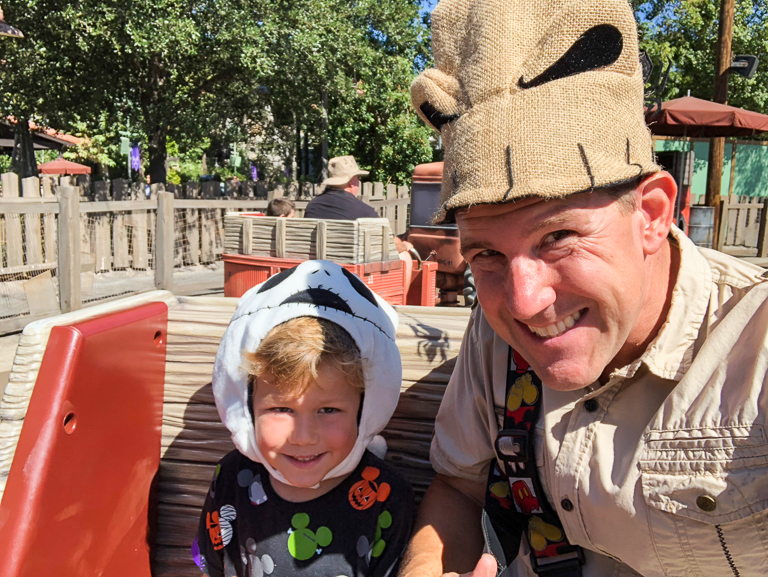 Being a "Disney" person, I especially enjoy all those Disney-related TR's, not only for the wonderful and heartwarming pictures, but to also witness the joy Disney brings to "older" and younger kids through the shared smiles and words!! Best wishes to your family. May God bless you with many more years of Disney magic!! Thank you for sharing! I'm glad you found the blog! Thank you for the very kind words and for following along all these years. It's certainly interesting to see how everything has changed now that there's new members. It's great seeing things through brand new eyes. Those height milestones are great because they are seeing something they've never seen before. Keep following along! 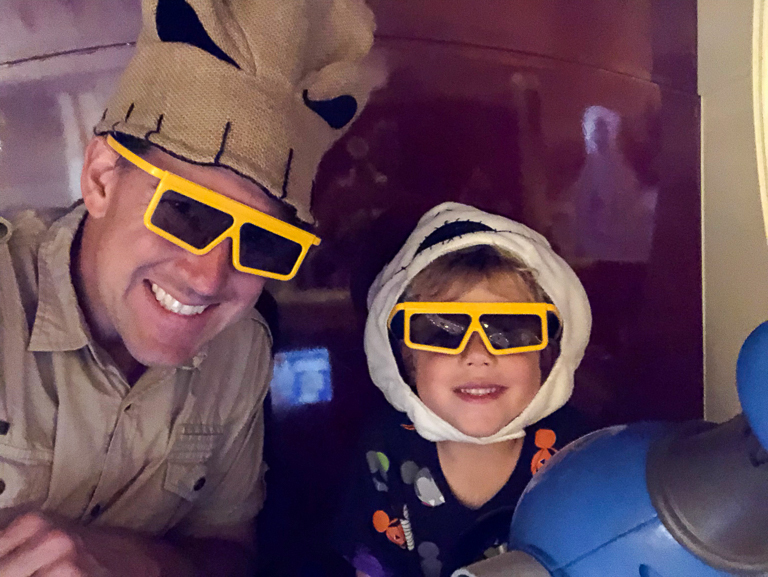 There's plenty of new Disney experiences coming soon!